I apologize up-front for the length of my post. I’m trying to purchase 1Password Families Annual Subscription through the Apple App Store. But, based on comments from other users on this site, this appears to be a disjointed and non-intuitive process. I’m currently using 1Password 6 or 1Password 4 on various mobile and desktop platforms (i.e., macOS, iOS and Windows). I used the stand alone version of 1Password for 4-5 years. I have (had) 1Password 6 installed on multiple iPhones, an iPad, a MacBooks and 1Password 4 on a Windows 10 PC. I wanted to move from a single user account to a family account to share passwords with my wife. Plus, I really like the app and wanted to show my support with an annual subscription. Let me point out, you are not making that process easy for those of us wanting to support your company. After installing the 30-day trial version 1Password 7 on my MacBook Pro, I then successfully set-up my 1Password 7 Account and migrating my existing vault. I also installed 1Password 7 iOS on my iPhone. I then attempted to add a family member. Here’s where I became confused. And, to quote your website, “1Password is the easiest and safest way to share password….”; but I could not find a way to add a family member. After looking at my subscription, it was clear I was not on the Families subscription and nowhere within app or 1Password.com website did I find a way to change my subscription plan. By the way, during the install/setup process, I was never offered an option for 1Password Family. 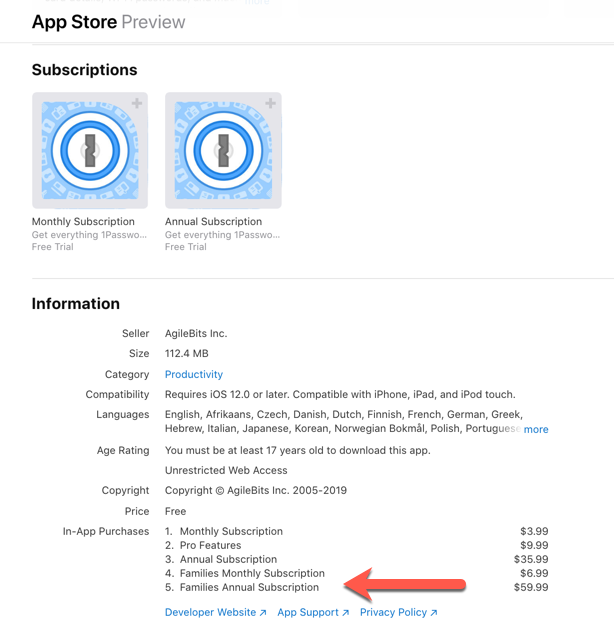 But, the monthly and annual Families subscription options are listed in the app’s In-App Purchases description. At this point, I sent an email to your support staff. Initially, as I understood Agilebits’ response, 1Password Families Annual Subscription was not available through the App Store and I would need to delete my trail subscription through the App Store to move to direct billing. After pointing out to your staff that the Information Section of the 1Password 7 – Password Manger on the description page within Apple's App Store, listed 4 In-App Purchases options. Including Family Annual Subscription (see screenshot). I also referred your staff multiple discussions from your Support Forum contradicted that statement he sent earlier. I was then told by your support staff: “It's possible to subscribe to a Family account via the App Store, but it's not possible to switch from an Individual account tied to an App Store subscription to a Family account tied to an App Store subscription. You would need to delete your account altogether and start over”. At this point, I honestly don’t know what steps I need to take. (1) I don’t know what is mean by “delete your account altogether and start over”. How are things going to be different this time during the install and setup process? I was never offered an options to select a “family” subscription when I initially setup 1Password 7. (2) Currently, I have the trial version of 1Password 7 installed on my MacBook Pro and iPhone. But, I still have 1Password 6 installed on a second iPhone and an iPad. What account(s) do I need to delete 1Password 7 and/or 1Password 6 and what is the correct process to delete my account(s)? I assume I have multiple accounts now, one for v7 and v6? (3) I don’t see a 1Password Families version in the App Store, so do I just use the same version of 1Password 7 that I down loaded from the App Store. I know I’m repeating myself, but the version of 1Password 7 that I downloaded and installed did liste “Families Annual Subscription” as and In-App Purchase option, that options was never presented during the installation and setup process. Again, I want to support your company and its efforts. But, it should not be this hard. If possible, here’s what I would like. A very simple and straight forward step-by-step guide that clearly walks me through the process to transaction from 1Password 6 to 1Passwrod 7 Families Annual Subscription that paid through the App Store. An App Store subscription is the only way that I'm going to continue to use 1Password. fyi, after I was told I could not do an App Store subscription of 1Password Families, I downloaded a competitor's app from the App Store that included a family subscription without any issues. But, I would prefer to continue using 1Password. Keep in mind, I currently have a trail version of 1Password 7 with an Annual Subscription on two of my devices and 1Password 6 on an iPhone and iPad and 1Password 4 for Windows. I'm sorry to hear you've received conflicting information about this. I agree, the process is unclear. At this point I can really only recommend setting up 1Password Families with direct billing. That said, it sounds like you're intent on billing through the App Store. As you mentioned I believe this should be possible, but I will need to confirm. Could you please provide the support ID in which you've been corresponding with us under previously (it is the first part of the subject line of the emails). Thank you for reaching out to me on this issue. I reviewed the emails I received from Jessy (1Password Support), but there's not a support ID. If you would like, I can redact email addresses on all the correspondence from Jessy and attach them. It's a total of 8-pages. As I mentioned in my last email to Jessy, I have recommended 1Password to a lot of folks. I know over 20 family members are (were) using 1Password. When I move to 1Password Families, I'm sure several of those families will consider changing to subscription account as well. While, most will not need 1Password Families, several will benefit from its capabilities to share password with their spouse. And, I know they will ask me to do the in-place conversion. That's why it's important for me to have a step-by-step how-to guide to walk me through the process. Again, thank you for your help. If possible please post the subject line. That should help me track it down. Understood, yes, thanks. And thanks for taking the time to share 1Password with your friends and family members. It's a generic subject line. I'm not sure if I created the subject line or if your automated support system generated the subject. Got it. Thanks @steve12. I was able to find the email thread. Please allow me some time to review it and see what the situation is. We'll be back in touch via email as soon as we can. At this point, I'm moving to another password manager. I would appreciate if you provide me with a link (how-to) to delete my account from every device that I have 1Password installed on and how to remove my vault from any 1Password server. It looks like Jessy has already been in touch with you via email about this. To avoid duplicating efforts I'm going to close this thread, but please continue working with Jessy.